After falling ill while on tour last fall, legendary blues musician B.B. King on Friday acknowledged that he was in hospice care at his home in Las Vegas, reports the Associated Press. 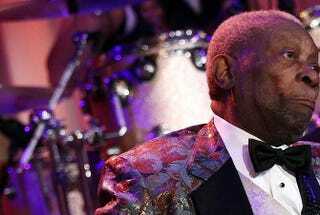 King, 89, was treated Thursday at a hospital near his home in Las Vegas for complications of high blood pressure and diabetes, according to Laverne Toney, a longtime business associate with legal control over his affairs, according to the news outlet. King was diagnosed with diabetes decades ago, Toney told AP, and he wishes to be cared for at home. Toney said that King on Friday acknowledged his illness and thanked fans on his official website for their well-wishes and prayers after he returned home from a brief hospitalization, the report says. An ambulance was called to the house Thursday after what Las Vegas Police Officer Jesse Roybal described as a domestic dispute between Toney and one of King’s daughters, Patty, over his medical care, the report notes. No arrests were made, and Roybal said no criminal complaint was filed. Toney disputed allegations made by the daughter to celebrity website TMZ that King had suffered a minor heart attack. Efforts by AP to reach Patty King were not successful, the report says. It was the musician’s second hospitalization in a month and comes after he canceled the final shows of his 2014 tour in October after becoming ill in Chicago, the report says. King, a member of the Rock and Roll Hall of Fame whose legendary guitar is named Lucille, is considered one of the greatest guitarists of all time. He has released more than 50 albums and sold millions of records worldwide, according to AP.